Contact lens exams are slightly different than a routine eye exam and include special tests that typically are not performed in routine eye exams for eyeglasses. Contact lenses are an excellent alternative to eyeglasses and wearers often claim vision is a more natural without extra weight and reflections from eyeglasses. Contact lenses are an excellent choice for athletes and those that are more active. Many wear contact lenses for cosmetic reasons or even altering eye color. 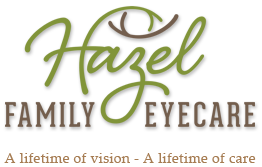 Hazel Family Eyecare offers all types and brands of contact lenses including soft and rigid gas permeable lenses. Contact lens fittings are very personalized as each eye is different in shape and diameter. A detailed measurement of the cornea will be utilized to aid in appropriate lens selection. In addition, sensitivities and lifestyle factors are considered when selecting the appropriate lens. We personalize the contact fitting to best match your visual needs during contact lens exams. Types of fittings include: spherical contact lenses, daily contact lenses, toric contact lenses for astigmatism correction, monovision and multifocal contact lenses, post LASIK fits, and keatoconus contact lens fits. New patient insertion and removal lessons are also given.